The UM-SJTU Joint Institute (JI) was jointly established by Shanghai Jiao Tong University and the University of Michigan in 2006. It is located in Shanghai, China. The goal of this partnership is to build a world-class teaching and research institute in China, nurturing innovative leaders with global visions. The Joint Institute upholds a unique educational philosophy of “Internationalization, Interdisciplinarity, Innovation, Quality”. Over the past decade, JI has built a world-class institution in China and created a widely-emulated set of development models by fusing Chinese and western educational philosophies and characteristics. JI collaborates closely with numerous renowned foreign universities with the goal of establishing an international educational platform for information exchange and resource sharing. The joint institute has attracted full-time degree program students from 17 countries including the United States, France, the Netherlands, Norway, Italy, Japan and Korea, as well as many international students for short-term exchange programs. Building a strong faculty team is a crucial component of the UM-SJTU Joint Institute’s educational mission. JI recruits faculty from all over the world. All faculty members at JI have either graduated from or worked in world-class universities such as Harvard, MIT, Stanford, Oxford, UC Berkeley, Cal Tech, UM, or Princeton. 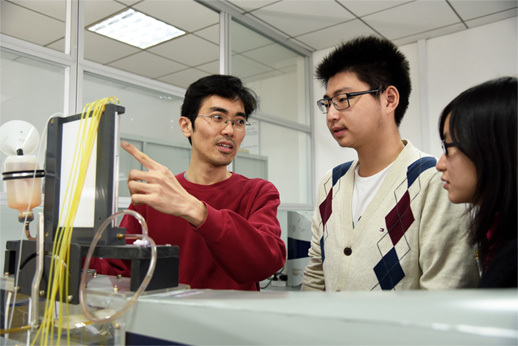 The UM-SJTU Joint Institute’s unique academic environment allows faculty, visiting scholars and students to keep up with the frontiers of technology. JI’s research projects are funded by Chinese national and municipal governments, local industries, and foreign entities. Our research fields and areas of collaboration keep growing broader and deeper. The academic excellence of students at the UM-SJTU Joint Institute has been recognized by world class universities as well as society. Among the 2010-2015 JI graduates, more than 80% continued to study at graduate schools, among which 90% rank among the top graduate schools in the world and 95% are located in the U.S. All those who chose to enter the job market were employed by leading domestic and multinational companies, receiving higher salaries than their counterparts from other universities. The quality of students of UM-SJTU Joint Institute has been highly recognized by world class universities and the society. Among the 2010-2015 JI graduates, more than 80% continue to study at graduate schools among which 90% are top graduate schools of the world and 95% are in the U.S. All of those who choose to enter the job market are employed by leading domestic and multinational companies, receiving higher salaries than their counterparts from other universities.